As the first autumn storms roll in and it's suddenly necessary to deal with the wet and cold again I've dug out this article from several years ago, originally written for Backpackinglight.com, in the hope it will be of interest and perhaps even useful for dealing with stormy weather. Lightweight backpacking is easy in warm, dry climates. It’s not that difficult in cold, dry climates either. You just need warmer clothing and sleeping bag. Change that dry to wet though and backpacking, light or heavy, becomes much harder. Staying comfortable when the rain pours down, wet mist swirls over the land and the ground is sodden requires the right equipment and the skill to use it efficiently, especially when such conditions last for days or even weeks at a time. In some places such conditions are not unusual. 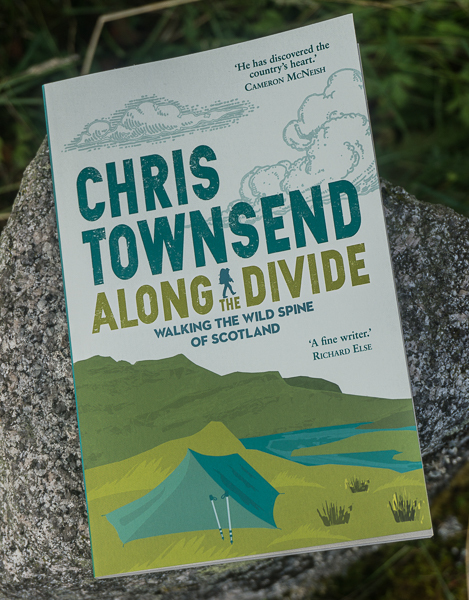 I’ve hiked for weeks a time in cold, wet weather in the Scottish Highlands, the Norwegian mountains and the White Mountains of New Hampshire. 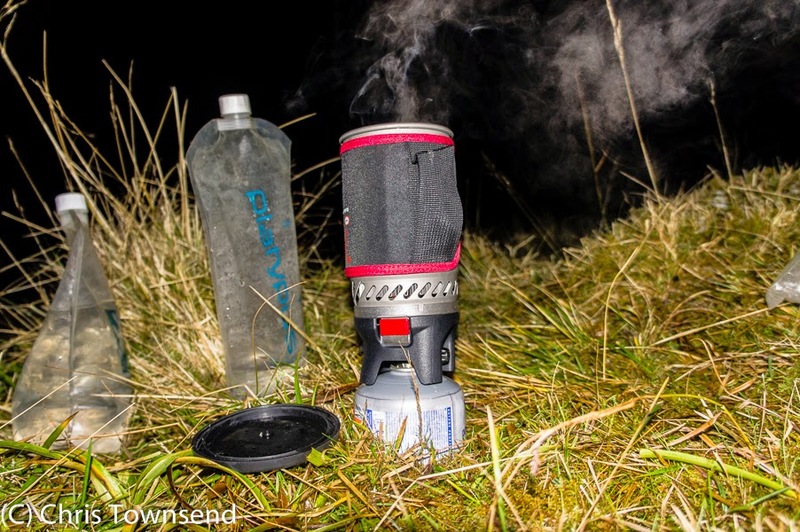 As I live in the Scottish Highlands I hike and camp in cold, wet weather regularly every year and have done so for over thirty years during which time I’ve tested a huge range of equipment and discovered what works well in the wet and cold and what doesn’t. I’ve also developed techniques that make the best use of equipment and minimize the chance of getting wet and cold, which is the big danger. Staying completely dry is not an option in these conditions; the choice is between being damp and comfortable or wet and cold. 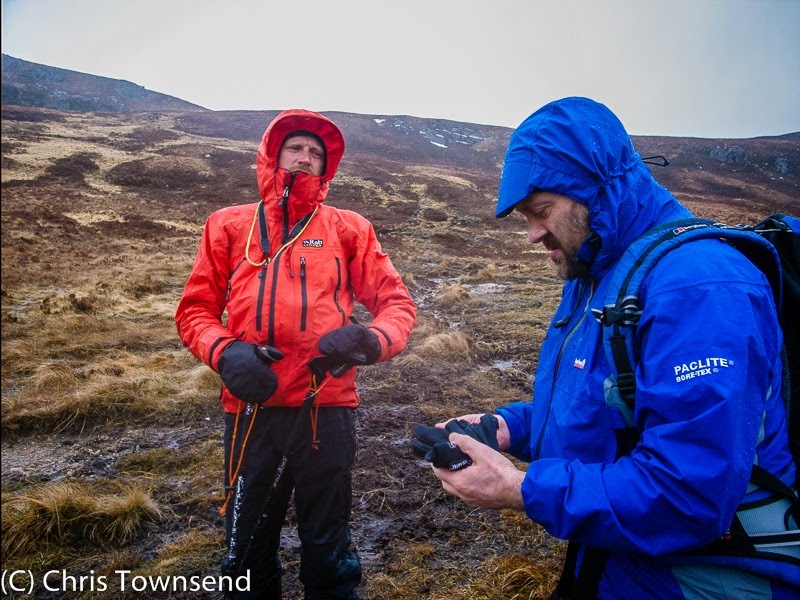 By cold wet weather I mean days when rain or wet snow falls much of the time and the sky is cloudy and the air damp even when the rain stops with little or no sunshine so there is no opportunity for drying gear. The rain need not be heavy – constant drizzle for days at a time is harder to deal with than a few hours heavy downpour. Strong winds add to the difficulties. Temperatures may range from -3 to +12°C. When these conditions more than a day they can be a real problem for backpackers. Packs are generally not waterproof. Fabrics are usually coated but seams and zips leak. I would not rely on a pack alone to keep gear dry. Pack liners and covers are options for boosting the water resistance of a pack. I prefer liners as covers have to be removed to access any contents, catch the wind and can’t be used if you store items like trekking poles or ice axe on the pack. Covers do absorb less moisture than most packs however. Big liners that fill the whole pack can be used but I prefer a couple of liners for water sensitive items and ordinary stuffsacks for everything else. Rubbish bags work ok but don’t last long. There are now an increasing number of much more expensive but much more durable waterproof stuffsacks and liners. Some packs with thick open cell closed foam back padding covered by mesh or open weave nylon can absorb a fair weight of water. Packs with closed cell foam or open cell foam covered with waterproof fabric absorb much less. Clothing needs to be quick drying and reasonably warm when damp as it will get wet to some extent over several days of rain. The outer layer must be waterproof. As temperatures can change rapidly a layer system works best. Thin layers also absorb less water than thicker ones and so dry more quickly. Base layers can be synthetic, wool or silk but never cotton, which is cold when wet and dries slowly. My current preference is for merino wool, which I find feels warmer when damp than synthetics though slower drying, and which goes on working day after day without smelling too bad or needing to be washed. That said, before merino wool appeared I used synthetic base layers successfully for many years, finding the best to be polyester ones such as Patagonia Capilene. Whatever the material thin base layers wick fastest and dry quickest. The main function of this garment is to maintain as dry a layer as possible next to the skin rather than to provide warmth. I find long sleeved garments with zipped collars the most versatile. I also wear wool or wicking synthetic briefs or boxer shorts but not long pants when hiking as I find these too restrictive and often too warm. I do carry long base layer pants for camp wear. Warmth is provided by thick base layers or thin fleece and synthetic insulation. If I need insulation between base layer and shell while hiking I wear a light fleece top. There are many suitable ones. Really, any thin fleece or wicking fabric top should be adequate. Such garments needn’t weigh more than 10-12 ounces (280-340 grams). Once the temperature drops below 40°F (5°C) a thin fleece top isn’t enough to keep me comfortably warm in camp even with a shell over it. For this I carry an insulated garment. Again I don’t use heavy, thick ones which are bulky to carry, requiring a larger pack. I do like hooded ones though as a hood is very effective at providing warmth. Synthetic fills are good in damp weather but are being challenged by water-resistant down. I like tops that are big enough to pull on over all my other clothing, including waterproof jacket, when I stop for a rest. 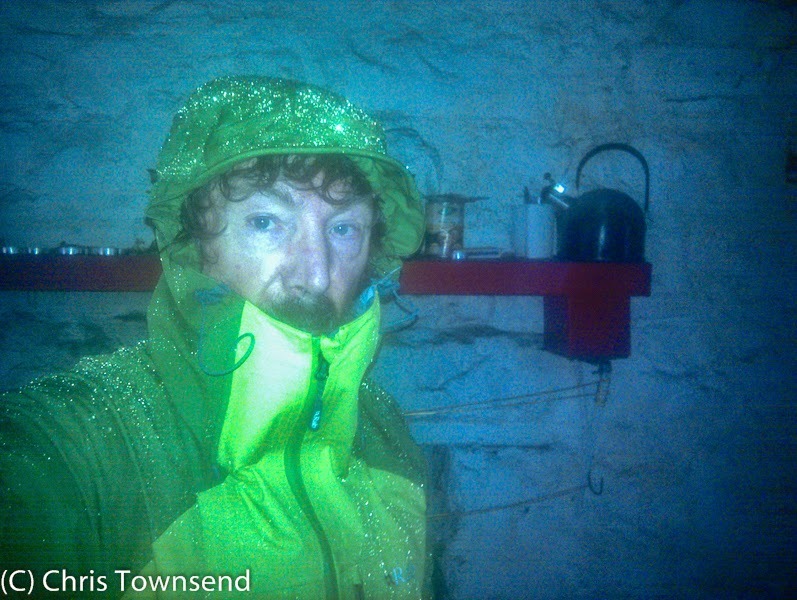 Sheltering in a bothy on a wet day. The outer shell is critical in cold wet weather. It must not fail. I have two strategies here, depending on the likely temperatures. At the warmer end of wet cold, above 5°C, I use two garments, a thin windshirt and a rain jacket with a laminated membrane (eVent, Neoshell, Gore-Tex). In damp mist, drizzle and light rain I wear the windshirt, as it’s far more breathable than any fully waterproof rain jacket. In heavier rain I wear the rain jacket over the windshirt, which I find means any condensation tends to stay on the outside of the latter rather than soaking into my fleece or base layer. Although slightly heavier than ones without hoods I prefer hooded windshirts as they are far more versatile. Just pulling the hood up can be all that’s needed to keep my head warm when the wind picks up. My favorites in recent years have been the Montane Lite-speed (6 ounces/165 grams) and the Paramo Fuera Smock (10.3 ounces/292 grams), with the latter being better in very strong cold winds as it’s a little thicker. In terms of design with waterproofs I find a hood with a wired brim makes a big difference in wind driven rain and snow. Pockets big enough for maps that are accessible when wearing a hipbelt are very useful too. Jackets needn’t weigh more than 500 grams and many good ones weigh much less. When the temperature is mostly below 5°C I wear one garment rather than two, a Paramo jacket because I find Paramo fabrics far more breathable than any coating or membrane. However the two layers of Paramo are also warmer than a membrane and as I run hot when the temperatures are above 5°C I can overheat too quickly in Paramo to be comfortable. Because of the weight and bulk of the garment I only use a Paramo jacket when I can wear it all the time – I don’t want it in the pack. Rain pants work well worn over synthetic or wool long underwear and I sometimes wear this combination in constant rain. However the lightest rain pants (100-200 grams) don’t last long if worn frequently and even heavier ones (200-500 grams) wear faster than jackets, especially at the seat, so I prefer to only wear them in continuous heavy rain. Otherwise, in temperatures above 5°C I wear windproof fast drying synthetic trail pants. In temperatures likely to be mostly below 5°C I wear Paramo waterproof trousers, which I find comfortable next to the skin and which have full length side zips for ventilation. An alternative would be stretch soft shell pants. These are comfortable and quick drying but they’re not fully waterproof and I prefer the Paramos, partly for the comfort and breathability and partly because I don’t need to carry rain pants as well. Waterproof jacket and windshirt hoods are surprisingly warm and often all that’s needed while hiking. However once the temperature is around freezing a hood is unlikely to be enough. In camp a warm hat can be welcome too. A soft fleece or wool one can also be worn to keep the head warm while sleeping. As a basic hat I like a light, simple and comfortable wool beanie (around 50 grams). Such hats are not at all windproof though and so need to be worn under a hood or replaced with a windproof hat. I always carry two hats in wet cold weather anyway in case of loss (I did lose my only hat in a strong wind many, many years ago and I still remember how cold my ears felt until I reached shelter). My second hat is a wind and waterproof one with a stiffened peak, ear flaps, a warm lining and with a neck cord to keep it on in the wind. Balaclavas are unnecessary for wet cold in my view but some means of sealing the gap between neck and hat can be useful when it’s really cold. For this I use a Buff (30 grams), a tube of stretchy polyester microfiber that can be used as a beanie and head band as well as a neck gaiter. Hands are a problem when it’s wet and cold. There is no way to keep them dry all the time. Gloves and mitts always get wet eventually even if made of waterproof materials (rain entering at the wrist, wet hands inside). The answer I’ve found is to carry two or three pairs and swop them over when a pair gets too wet. That pair then goes inside my clothing where it can warm up and start to dry. My basic gloves are thin fleece, softshell or wool ones. Over the years I’ve tried many types and never been completely happy with any of them. Wool and ordinary fleece aren’t wind resistant enough while windproof fleece is cold when wet and takes ages to dry. Softshell is probably the best material. 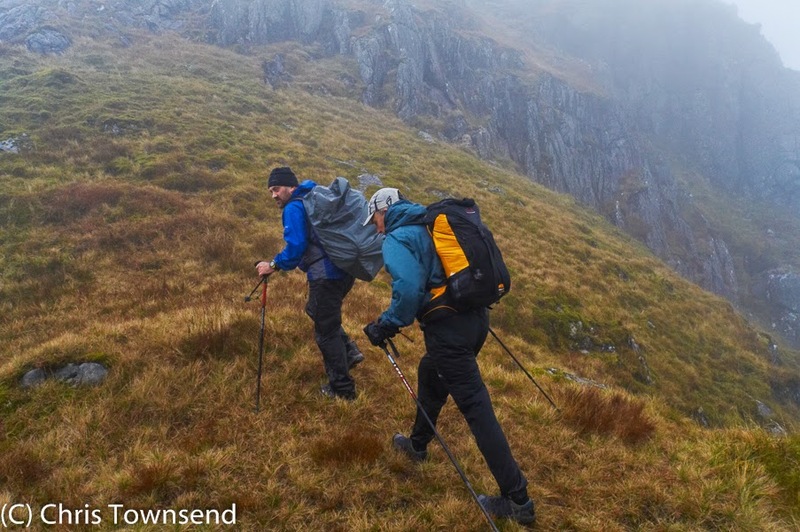 And all types wear quickly if used with trekking poles or ice axe unless the palms and fingers are reinforced. I now just accept that these gloves will need replacing frequently. For heavy rain and extra warmth simple waterproof shell mitts are useful. These can be worn over bare hands as well as over inner gloves. I find the combination of thin fleece gloves and overmitts warm enough until the temperature is well below freezing. My spare pair of gloves is a thicker pair with a windproof shell and a synthetic fill or fleece lining. I only wear these in extreme cold as they are very warm. My clothing system is sized so that I can wear everything at once if necessary. I don’t carry spare clothing except spare socks (see Footwear below) but some items are usually in my pack – mostly long underwear pants and insulated jacket, sometimes fleece top as well. The clothing is also versatile – all the tops can be worn next to the skin so if my base layer is damp and I start to feel chilly when I make camp I can strip it off and don the fleece or insulated top next to the skin. While hiking I wear the minimum needed to feel just on the right side of cool as this minimizes condensation. This is often just base layer and windproof or waterproof. If I start to feel hot I remove a layer and open vents, if this won’t let rain in. When I stop I know I’ll cool down rapidly so I close vents and put the insulated jacket on over everything else before I feel cold, even if my rain jacket is wet and it is raining. This is one big advantage of synthetic fills over down. Not having to remove my rain jacket to put on a warm top and then put the rain jacket back on means I don’t lose any heat and saves time. I know the synthetic top will dry quickly in camp so I’m not worried about getting it wet. Clothing is packed to be accessible without exposing other gear in the pack to rain. If I’m not wearing rain jacket or pants they go in the top of the pack outside of any waterproof liner or else in a mesh pocket on the back of the pack. The insulated jacket goes at the top too, packed as loosely as possible to avoid crushing the fill more than necessary. Head and handwear go in an outside pocket. If it’s raining when I make camp once my shelter is pitched and I’ve collected water I strip off wet shell clothing in the vestibule or before I put the ground cloth down in a tarp. That way I keep my sleeping area dry. Once this is done I sit on my insulating mat and put on any extra clothing needed and, if necessary, get into the sleeping bag. A good Durable Water Repellency (DWR) treatment means that clothing will shed light rain, absorb less moisture and dry more quickly. Rain clothing and insulated clothing comes with DWR but this won’t last and needs renewing every so often (how much depends on the fabric and how much the garment is used). Often simply washing a garment, preferably in a pure soap product rather than detergent, and rinsing it thoroughly can restore the DWR as it can be reduced by sweat and dirt. Keeping clothing clean enables the DWR to perform at its best. Eventually though the DWR wears off and needs replacing. This can be seen when the fabric starts to absorb moisture much more quickly. In cold wet weather your feet will get wet so again the question is how to keep them comfortable not how to keep them dry. 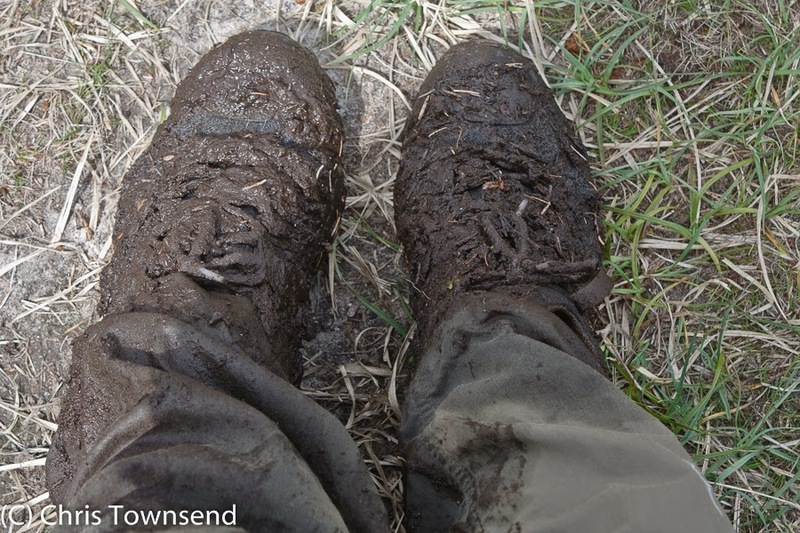 Footwear with waterproof membranes combined with waterproof gaiters will keep your feet drier longer but once they get wet they’ll stay wet much longer too as such footwear is very slow drying. Membranes do add warmth however, which can be welcome in temperatures around freezing. In warmer temperatures some people, myself included, find membranes too hot so feet get sweaty. Also, membranes usually fail and start to leak long before the rest of the shoes or boots has worn out, leaving you with footwear that leaks but also takes ages to dry. In above freezing temperatures I like trail shoes without membranes. Combined with merino wool socks my feet stay warm even when wet as long as I keep moving and don’t stop for too long. Wool socks do absorb more moisture and take longer to dry than synthetic ones but I find them warmer when wet, especially after several days wear. In snow and when the temperature is below freezing this trail shoe/wool sock combination isn’t warm enough for me so I either wear a waterproof sock with the shoes or a heavier shoe or boot with solid fabrics rather than mesh. Although the durability isn’t great waterproof/breathable socks do work. On a two week trip in the White Mountains of New Hampshire during which the temperature stayed around freezing, rain or wet snow fell every day and the ground was sodden and, at higher altitudes, covered with several inches of snow I wore mesh panel trail shoes and SealSkinz socks and my feet were comfortable throughout the trip. Even when the SealSkinzs start to leak they are warmer than ordinary socks due to the windproof outer. However in temperatures much above freezing I find them too hot. 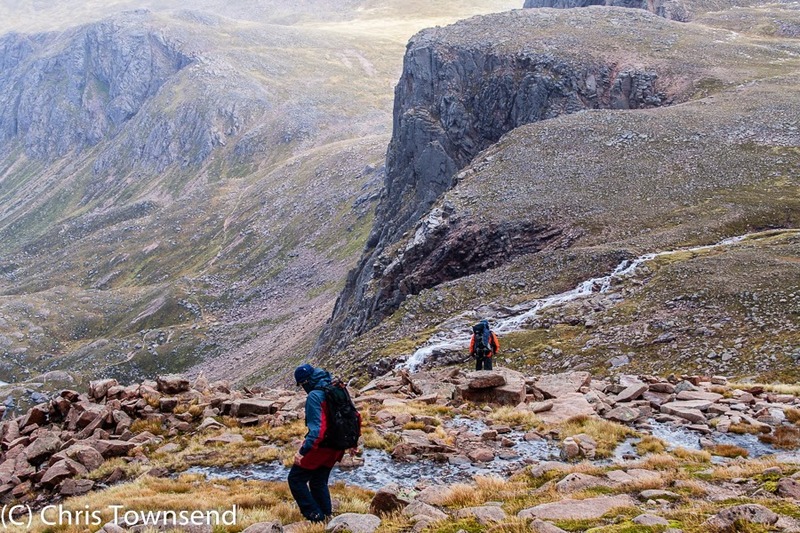 I tried them on a TGO Challenge crossing of the Scottish Highlands in 5 to 12°C temperatures and quickly reverted to ordinary wool socks, keeping the SealSkinz for camp wear. Gaiters keep snow, dirt and some water out of your boots. If the snow or mud will be deep I wear them but mostly I don’t as I find them awkward to use, often too hot and more weight to carry. Dry warm socks are invaluable for camp wear and I always carry a pair. Once you stop feet in wet socks and shoes cool down quickly. One of the joys of camping in wet cold weather is pulling warm dry socks onto damp cold feet. A stormproof shelter in which you can stay dry and comfortable is essential for enjoyable camping in wet cold weather. Whatever the type of shelter one important factor is size - if the shelter is so small that contact with the fabric is likely then keeping dry will be harder as the walls will often be damp with condensation. Ventilation helps reduce condensation but also allows in drafts and sometimes rain. 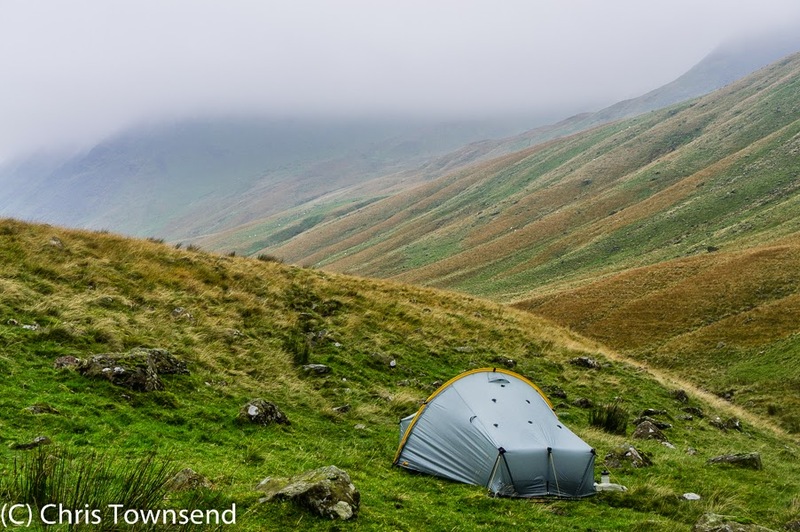 This is a problem with many single-wall tents, which have excellent ventilation to combat condensation but which can be chilly in strong winds. I much prefer double-wall tents as the inner walls usually stay dry and protect against drips from the outer ones and also keep out the wind. Double-wall tents are warmer too. As long, that is, as the inner walls are made of solid fabric. Mesh inner walls let breezes and drips through and are not worth the weight in cold weather in my opinion. I’d rather just carry the outer tent with a separate ground cloth and save some weight. Indeed my other choice after a double-wall tent is a shaped tarp or floorless tent with steep enough walls that condensation mostly runs down rather than drips and plenty of room inside. Whatever the style covered vents high on the shelter are very useful for allowing moist air to exit. In calm humid conditions copious condensation is still likely however. With floorless tents or tarps I think pyramid designs are best. Floorless single wall shelters aren’t as warm as double-wall tents but there is far more room for the weight. Shelters for the cold and wet need a covered area for cooking so once inside you don’t have to venture out into the rain. With a floored tent this means a big vestibule, with a tarp or floorless tent enough space to set up a stove on the ground away from the walls. When choosing a site it’s best to look for shelter if the wind is strong but also somewhere that won’t flood. These two criteria may be in conflict. I’ve often ended up camping on windy knolls when every sheltered hollow or flat area was sodden. Whatever type of shelter you have it needs to be one you can pitch fast so you can get under cover quickly as you’ll start to cool down quickly once you stop. When it’s raining I like to be inside my shelter within ten minutes of stopping, preferably less. I don’t think there are necessarily any special requirements for sleeping bag or mat in wet cold weather. Some campers prefer synthetic bags or down bags with waterproof or water-resistant shells but I find a standard down bag fine and lighter in weight for the warmth. If I used a shelter that gave less protection than a double-wall tent or a large floorless tent or tarp I might change my mind. I carry a waterproof/breathable bivvy bag as an emergency item anyway and could use this inside the shelter if necessary. Once in my shelter the sleeping bag doesn’t ever get more than slightly damp and never enough for this to be a problem. When in the pack the bag needs good protection from the wet and I stuff it in a waterproof stuffsack and then a larger trash bag or waterproof pack liner. That way it stays dry even during a day long torrential downpour. In the shelter I take care to keep the sleeping bag away from the walls and I’m very careful with drinks and food so I don’t spill them on the bag. If conditions are exceptionally damp and the inner walls of the tent become damp, which occurs on rare occasion, I spread dry clothing such as my insulating jacket over my sleeping bag. Cooking in the vestibule from the warmth of the sleeping bag while the rain hammers down outside is one of the delights of wet weather camping. There are many suitable stoves. Low profile ones with windshields are best. Whatever the stove it needs to be positioned so that if it tips over it won’t come into contact with anything flammable and the pot on top won’t dump its contents in the inner tent. A large vestibule is needed for this. Unless the weather is really appalling it’s always best to have the outer tent door open or at least the zip partly undone. With the right gear and the right techniques camping in wet cold weather can be comfortable and fun. If gear is selected carefully a heavy pack isn’t required. I usually have a base weight of no more than 5kg. Lower weights are possible if you are prepared to make the necessary compromises. I'm thinking of having my down sleeping bag 'proofed' by one of the specialist cleaners (there's one not far from us at Rotherham) before next year's Sarek trip. Seems like something worth doing, just in case. Great info/advice Chris, thanks. One query; base weight = 5kg. What is "base weight"? Ken, base weight is the stuff you have throughout a trip - it doesn't include items like food and water whose weight varies from day to day. Of course it's not fixed in that some clothing may be worn at some times and in the pack at others. I include in base weight all clothing I don't expect to wear all the time - so my waterproofs are in the base weight and if I have three pairs of socks then two will be in the base weight. A great piece and extremely relevant to Scotland! Do you sleep with clothes on or clothes off Chris ??? Usually without clothes. At most base layers and socks. I'm a warm sleeper. 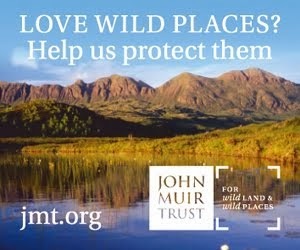 Great article and living in Shetland very relevant to me. This winter has been particularly wet and windy. Even though not that cold the other night it felt a lot worse with the extreme damp cold ground and air. 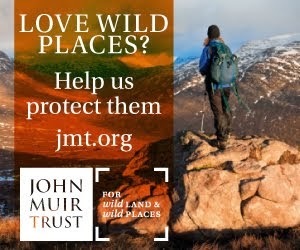 Any recommendations for a shelter for high winds (assuming limited natural protection), I was considering ordering a trailstar, but I'm open to other suggestions? Thanks Kevin. 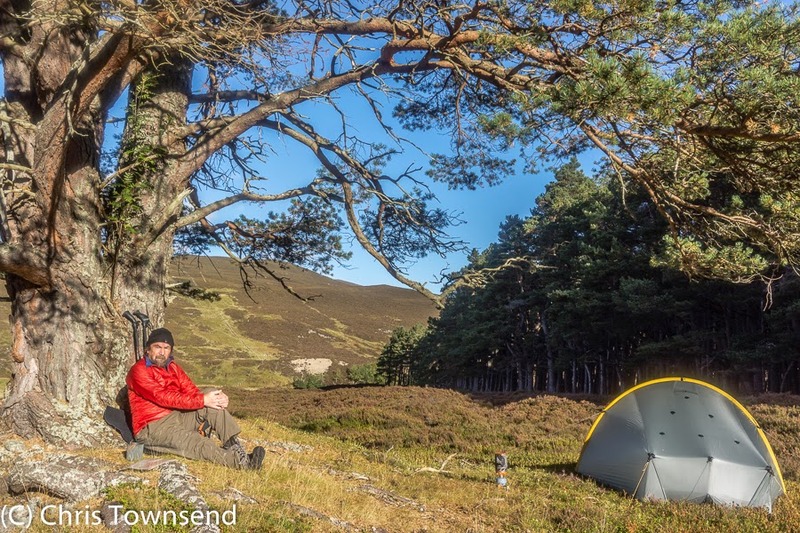 The Trailstar is a great shelter as long as you're happy not having a door or a solid inner. 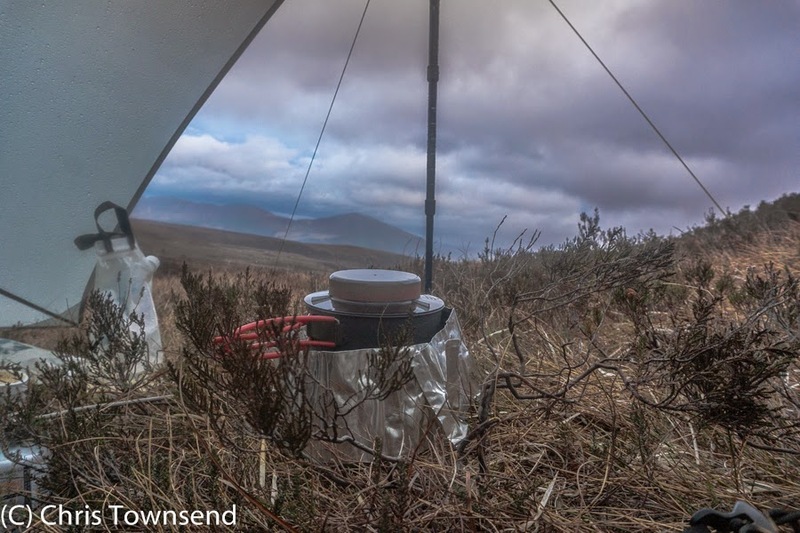 It's certainly one of the most wind resistant lightweight shelters I've tried. It's my first choice.